We are losing our World War II Veterans at the rate of approximately 372 per day. Honor Flight Austin will continue to do whatever it takes to fulfill the dreams of our veterans and help our senior heroes travel absolutely free to see their Memorials in Washington D.C. Honor Flight Austin knows that our veteran heroes aren’t asking for recognition. It is our position that they deserve it. Our program is just a small token of our appreciation for those that gave so much. Please help us continue to make their dream of visiting their memorial, a reality. Become a Sponsor, today. 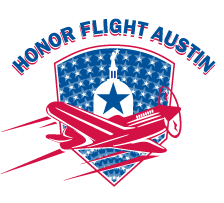 Honor Flight Austin is a 501(c)(3) nonprofit organization. Please make checks payable to Honor Flight Austin.